After trying several other DIY approaches to my fertilizer rust dis-colorization, this product was the only one that actually removed the stains. 23:15 - This stuff really works..Honestly the effectiveness of the product surprised me. Would recommend to anyone! This product worked well. I had to use more than expected and apply a second treatment, but it removed the rust stains. I suggest leaving on a little longer than the instructions say. Recently purchased a home. There were rust spots all over the driveway apparently from lawn fertilizer. I tried everything to remove them with no luck. i came across this website and decided to give SEAL GREEN a try. It did take off all the spots. It did bleach the driveway in places but at least it worked. The product works exactly as advertised. Took all the rust out of our travertine tile driveway. Highly recommend. The product works exactly as advertised. It took all the rust out of our travertine tile driveway. Highly recommend. I was amazed at what this product did. 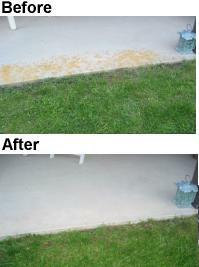 I followed directions, and the 8 fertilizer stains on the driveway completely disappeared. Usually production will work about 80%. This one worked 100%, and I was totally delighted. It works excatly as is indicated. Great product - I had stains on my concrete side walk from a Scott's moss out application where a few grains landed on the concrete This stuff was amazing. I will suggest that you use a small quantity at a lower dilution to see it that works and covers more area. Did not do job, not even a tiny removal. I want you to know that I just used your concrete cleaner. I have to say that it was one of the, if not the best product I've ever used. It did what it was supposed to do 100%. Usually products don't work at all, or maybe 70%. I was surprised and delighted to have the fertilizer stain completely removed from my driveway. I will recommend your products where ever I can. The greatest product out there..I have a paver driveway and a very large amount of rust. Nothing would touch it. Used this product and as I spread it on the rust rolled off...Awesome! !